It is not hard to describe Frieda. She is fun-loving, adventuresome, willing to help when needed along with being very energetic. She recently celebrated her 95th birthday with an open house provided by some of her friends. Frieda was born June 27, 1923 on the Ballard Road family farm, the youngest child of David A. and Bessie (Sheetz) Burba. An older brother and three older sisters completed the family. She is proud to say that one of her grandfathers, Evan Burba, was a Civil War Veteran. Her father raised wheat and corn which he took into town to be ground into flour. She said they also raised hogs. She remembered that the farmers would help each other when it was time to harvest the crops or when it was time to process the hogs. All the processing of the meat was done on the farm. The family raised chickens and had a vegetable garden. They canned the meat and the vegetables in Mason jars during the season and stored the jars in a cool place for the remainder of the year. They did no go to restaurants she said the family always ate in the house, but the bathroom was outside. She says they had dogs and cats as well as a cow for milking, but the dogs and cats were not allowed inside the house. But she did admit that sometimes she would smuggle a cat inside for a visit. The family had one horse which the kids would ride from time to time, but the horse “Minnie” was rather obstinate. If more than one person tried to get on her back to ride, Minnie simply sat down! As a child, Frieda attended Anderson School, a one room school, for her first six years and then completed her elementary education at Union School. She graduated from Xenia Central High in 1941. During her high school years, she stayed with the Neeld family during the week where she watched their children. On weekends, she returned to her family home. Her very first job, at the age of 17, was at Woolworth’s Store in Xenia. She worked behind the candy counter. Her job entailed waiting for the customers to select the pieces they desired and then she would carefully place all the candy in a bag, weigh the bag and collect the money for the purchase. Because of her age, this was the only job she was able to secure. She remembers Pearl Harbor Day very well since she was working at Woolworth’s that day. In January 1942, she secured employment at Wright-Patterson AFB as a clerk-typist. During part of that time she was working as a secretary on the flight line in the Engineering Building. It was there that the planes were brought in for repair. The Memphis Belle was one of those planes she saw when she worked there. She married Everett Parks in 1945 that passed away several years ago. She accepted a position at Vernay Laboratories in Yellow Springs where she was a Secretary. She stayed in that position for a total of ten years beginning in 1946. Another opportunity presented itself when she was asked to assume the position of Executive Secretary to the Dayton Power and Light Southern Division Manager. She liked that job so much that she stayed for twenty-six years before retiring. Frieda says she never looked for a job; she was such a good secretary that she was invited to accept a new position. She says that each of the she had were very fulfilling. She chuckled when she remembered that each time she took another job it was closer to home and the pay was better. Aside from her business career, she is a long-time member of Union United Methodist Church. 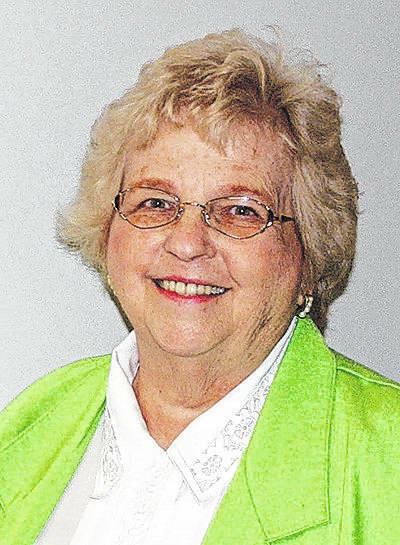 She has taught Sunday School, been an officer for the United Methodist Women, Church Treasurer for more than 30 years and for 21 years was the representative to the Otterbein Retirement Center where she received the Key Person Award. She has also been the Lay Delegate to the West Ohio Annual Conference. Always willing to lend a hand, she was the Treasurer for the Xenia Area Association of Churches for a number or years. She also served as President of the American Business Women’s Association, receiving the Woman of the Year Award. She was President of the Xenia Business and Professional Women’s Organization and held the position of Chairman of the Old Fashioned Days Celebration when that organization sponsored the event. She has volunteered in many different areas, especially since she retired. One of her favorite and current activities is serving as a volunteer for the Greene Memorial Hospital. She has volunteered at the hospital for over twenty-three years, logging in thousands of hours. She also served on the Auxiliary Board as Secretary and also Treasurer. She was honored to receive the prestigious Kenneth Beams Award from Greene Memorial which is given for service to others “above and beyond the call of duty”. She recalled the April 3, 1974 tornado she was a patient at the hospital having had minor surgery. She remembered hearing the sound of banging doors, and then an eerie silence. In addition to working at the gift shop at Greene Memorial Hospital on a regular basis, she loves to garden, read and sew. Joan Baxter is a longtime historical columnist and local resident.